Michael found this brightly coloured fly, dead, outside. He was so impressed that he brought it inside. I was so impressed that I grabbed my macro lens, an extension tube, and my 50mm lens, hooked them all up together and went for a closer look. Details: Nikon 105mm 1:2.8 macro, 52.5mm extension tube, 50mm 1:1.8 reversed, ~f/22, 1/100s, ISO 800, SB-800 flash. Oh - I just saw the creative commons license at the bottom. This isn't commercial, so I'll go ahead and use the pic, crediting you at the end of the PowerPoint. 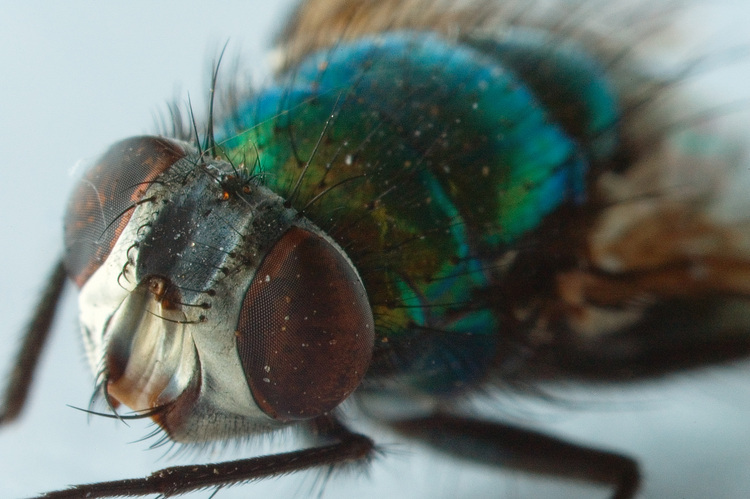 If for any reason this ISN'T ok, let me know - I just love the beautiful colors on this fly and would enjoy having it be part of my presentation.